This report was updated on 23rd Jan 2014, find the new report on Link. 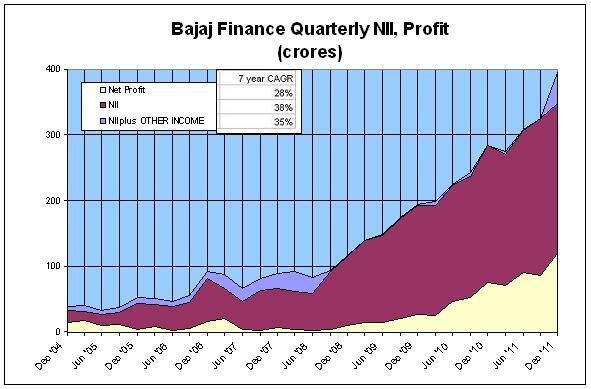 Bajaj Finance is an NBFC on a growth path. It is a leader in auto and consumer durables loans, but customers are spread across Retail 60% and SME/ Corporate 40%. Key strengths are all India reach; strong ‘Bajaj’ brand and rapid entry into new growth segments. Revenue, NII, Net Profit and EPS have grown at 28-41% CAGR over 7 years, and performance did not slow in 2011. Gains can accelerate in a falling interest rate scenario. Invest in this potential multi bagger. 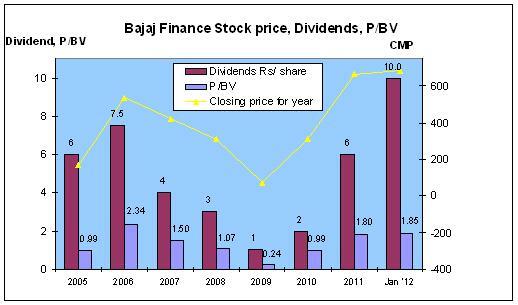 Bajaj Finance (BF) is a NBFC promoted by Bajaj Auto over 23 years ago. Post a 2008 restructuring, Sanjiv Bajaj is handling the financial services business of Bajaj Auto group, including Bajaj Finance. BF was set up as a captive financier of Bajaj Auto’s 2 & 3 wheelers. It has now expanded to related areas such as loans for Consumer Durables, Against Property, Small Business, Construction Equipment, Against Securities, Personal Loans, and Insurance Services, see Fig 1. About 60% of its business is consumer oriented – B2C, while rest is B2B, with a SME focus. The largest Segments are Consumer durable and 2/3 wheelers. BF is diversified across customer segments and geographies; this de-risks operations and inspires a confidence in continued growth. BF has a network of 4000 distribution partners/ dealers and 225 points of presence. It has 5 million customers across the country. In 2011, BF added 603 permanent employees, taking total employees to 1657. This is a sign of business confidence and investments in expected growth. Funds sourcing – CRISIL has rated it at FAAA/Stable for FDs, indicating a high safety with regard to timely payment of interest and principal. The company has just launched a new loan product specially designed for SMEs, called “flexisaver”. This could be an excellent offering for this segment. BF has a capital adequacy ratio at 17.5%. This is good. Even so, to fund rapid growth, BF is expected to raise Rs 750 crores in 2013 through a QIP or Private equity route. Management intends to raise its equity holding to 75% from the current levels. This indicates high ownership, which is good. See Fig2. Another positive is the stake holding from Mutual Funds, FIIs and DIIs. There are a large number of NBFCs in India (>10,000). These are relatively unregulated companies, unlike Banks that are governed by RBI. In this fragmented market, there is tremendous opportunity to offer Loans and Financial services in a fast growing economy of India, to Individuals (Retail), SME and Corporates. RBI has projected a 16% growth in loans for Banks; NBFCs should have higher industry growth rates. Current projections – of fall of interest rate cycle, and lower inflation, is positive for this sector. See article on this Trend. 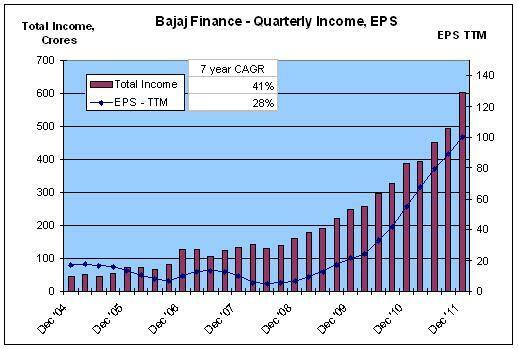 Strong ‘Bajaj’ brand; BF also shares in the growth of Bajaj Auto through the Auto loans service. Also a leader in Consumer Electronics/ durables loans with presence in showrooms of top Retail chains. With Sanjiv Bajaj at the helm, there is clarity in management succession. He is also a talented and ambitious finance professional and promoter. A strong distribution network, spread nationally with presence across customer segments, industries and geographies. The BF strategy is to diversify loans with a 30% segment cap. This will provide a de-risked business model. The group financial services ambitions and new initiatives are going to be routed through BF. Listed long back, BF has shown excellent performance over the last 5-7 years, as seen in the charts. The Net Profit, Net Interest Income and NII plus Other Income have grown at 28-38% CAGR over 7 years. Growth has really accelerated since 2008. See Fig3. Revenues rose over a 7 year period at 41% CAGR; and EPS at 28% CAGR, see Fig 4. 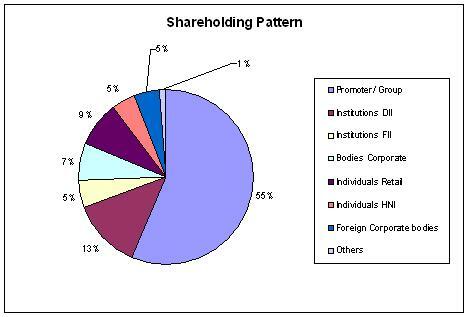 The share has appreciated by 22% CAGR over 7 years. However, post the 2009 fall, the appreciation has been very steep at 112% CAGR. 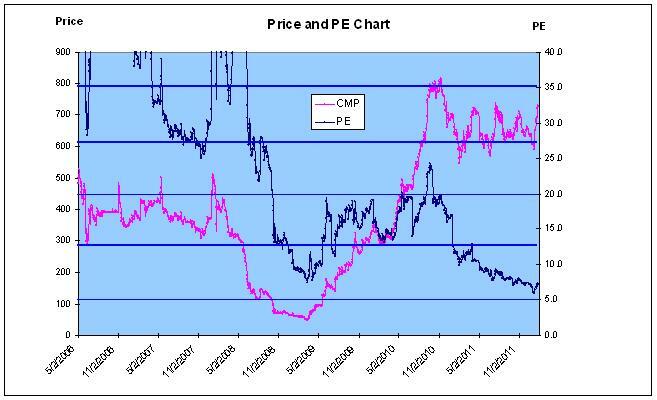 Price and PE chart shows that PE is currently at all time lows even though the Price has risen to 700+ levels. 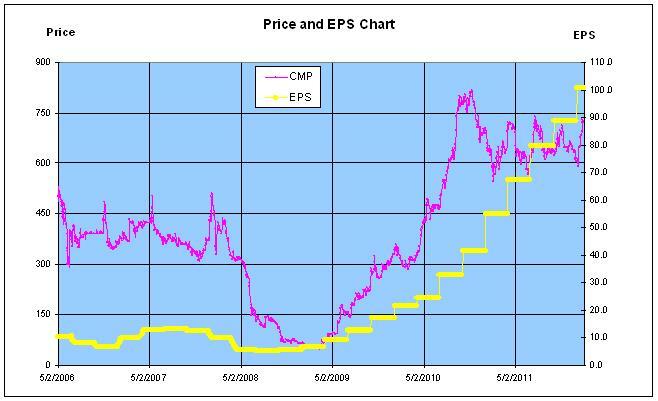 It seems the full effect of the Earnings improvement is not yet reflected in the Price, see Fig 6. ROCE is 12% and ROE is 19.7%, these are good ratios. The EPS growth has accelerated since 2008, (Fig 7). This is an excellent chart of the firm’s growth. Its asset under management stood at Rs 11,919 crore as in Dec’11; as against Rs 6,868 crore a year back (up 74% YoY). The overall credit growth of the company is significant at a time when the entire industry is experiencing a slower credit off-take. Of late, BF has improved asset quality. Its net non-performing asset (NPA) ratio stood at 0.25% in FY12 Q3 as against 0.33% in Q2. Current net NPA is the lowest for the company in the last five years. BF in this comparison shows better growth characteristics. See Exhibit 8. BF is also superior due to multiple customer segments – a de-risked business model. Three-year projections of BF financials indicate a robust ramp up of revenues and profits, Exhibit 9. Interest rates unpredictability. This will affect our growth projections for BF. Promoter driven consolidation. Bajaj group has financial firms like Bajaj Allianz (Insurance), Bajaj Financial Solutions (Wealth mgt) and Bajaj Finserv (Holding Co). Consolidation will change the outlook. Indian market is underserved for loans and financial services. Quick calculations show BF has 5-7% market share among listed Indian NBFCs (non Bank). While small, this indicates a big market for BF to grow. In the last three years, BF has embarked on a business trajectory that, if sustained, can make it a top 3 NBFC in 4-6 years. In essence it may move from mid-cap to large-cap, and shareholders could be holding on to a ten bagger. Invest now and systematically for long-term out-performance. Hi, Is it a good option to buy Bajaj Finance at the current level? Should I wait for an correction? i agree with your research report and also holding 1000 shares bought at different price averaging 677. All the articles in jainmatrix helps the readers greatly to increase the knowledge of stocks on both fundamentals and technical prospective .